Elemental Impact's tagline is "Sustainability in Action" - Action includes a strong, influential voice for our important work. Communication in the cyberspace age requires using technology- based platforms to reach a vast, global audience as well as the local community. Blogs, Facebook and LinkedIn are effective tools when used with purpose and direction. 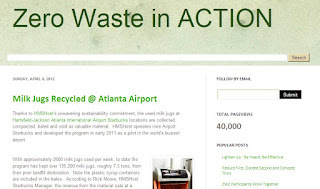 Ei has two active blogs: 1> Zero Waste in ACTION and 2> The IMPACT, which together are nearing the 60,000 page view milestone. On April 11, the ZWA Blog topped 40,000 page views and has an escalating readership rate. It takes commitment to write pertinent blog posts and promote them via FB and LinkedIn Groups. In addition, blog posts are promoted the old fashion way: newsletters and e-mails. Each organization mentioned in a post is written a personal e-mail with the link and a request to share the link in their networks. One of Ei's 2012 goals is to establish a powerful cyberspace network with our partners where news items are cross shared within our respective communication vessels. Last week four Ei Partners shared ZWA Blog posts in their networks. Ei has a Google Alert set for each partner and monitors FB feeds to keep abreast of newsworthy items along with interesting tidbits to share. Working together, Ei may serve as the hub for a powerful information network geared to those entering and on the sustainability journey. In addition to the written word, Ei founder Holly Elmore keeps a busy speaking engagement calendar. Infiltrated with humor and passion, Holly shares the zero waste message in formal sessions at conferences and workshops as well as podium time at events. In early April, Holly traveled to Chattanooga with the Institute for Local Self Reliance team to lead a session at a well-attended Zero Waste Workshop. The ZWA Blog post, Chattanooga Building a Green Brick Road, gives a workshop overview. Recently, Holly spoke at the Atlanta Chapter of the Building Owners and Managers Association's Green Summit in tandem with Adam Glasgow of WastePro. The presentation was the impetus for Tishman Speyer to join the Zero Waste Zones for their five Atlanta properties. See the Ei Speaking Engagement page for an overview along with a downloadable version of Holly's PPT. In late February Holly was on the short list of speakers at the reception honoring Atlanta's sustainability leadership hosted by the Metro Atlanta Chamber and the American Sustainable Business Council. The ZWA Blog post, Atlanta Celebrates Sustainability Leadership, gives a recap of the impressive reception. Ei Chair Scott Seydel and Holly make a powerful team for creating visual communication platforms via film and still shots. The Ei FB Album page is a valuable resource with close to 50 well-documented albums filled with pictures from the journey. Ei Partners often download album photos to use in their PPT presentations. At Global Green's NOLA Resource Recovery Conference, Scott filmed Holly's Sustainable Food Court Initiative ten-minute session. The video is an excellent introductory vehicle for those interested in the SFCI. To view the embedded video, see the ZWA Blog, SFCI Video from the Ei Film Crew, or click this link for the YouTube version. Websites are the foundation to other communication platforms. Well-organized websites with easy-to-follow navigation to pertinent information are key to providing depth to blog posts, speaking engagements and other mediums meant to trigger interest. 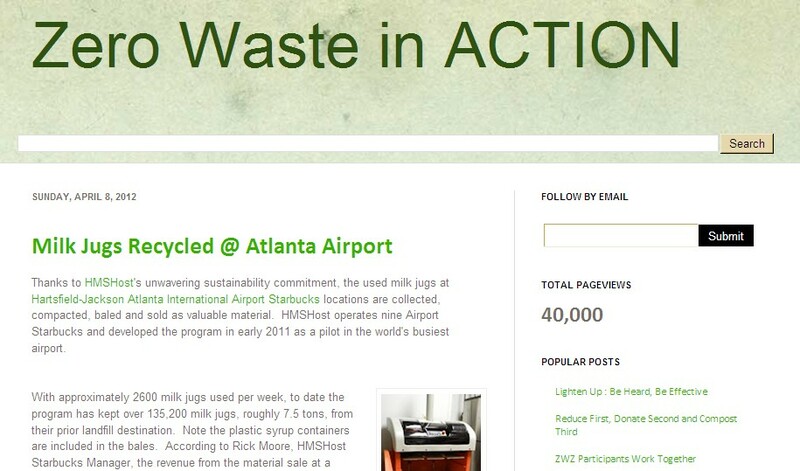 Traffic is escalating on the Ei's two websites: Elemental Impact and Zero Waste Zones. While writing this paragraph, the website weekly reports came in - traffic increased 32% over the prior week for the Ei site and 23% for the ZWZ site. Most weeks traffic shows a percentage increase over prior weeks for both sites. room - humor is effective! Versatility is key to developing an influential voice, both in the communication vehicle used and the message itself. It is important to understand how to reach the intended audience in a voice they will hear. With the corporate community the target audience, Ei leads messages with sustainability makes good business sense and most often improves the bottom line. Many times the environmental benefit is never discussed. The ZWA Blog post, Lighten-Up: Be Heard, Be Effective, gives great examples of how three organizations used humor within their message to create successful tools and programs. For a couple of weeks, it was the most popular post on the blog. How can you contribute to Ei's cyberspace voice? "Like" the Ei FB page so you know when blog posts and other newsworthy items are published. Share blog posts, pictures and other Ei information within your networks. Please tag Ei so a thank you response may be written. Be vocal and join in the conversation via comments on posts. Send Ei your press releases, pictures (low res, please) and other interesting items that complement our message. Remember it is a two-way street and Ei is eager to share partner and industry information. Thank you for your continued support and enthusiasm for Ei's important work. Collaboration is key to success - your active participation is necessary to shift corporate and community standards to sustainable practices. We can and ARE building a bright future for our children! Wow! I'm the 41,000th viewer! Keep up the great work Holly and Ei! Having achieved Zero Waste recently, I can tell your viewers that it is indeed possible to achieve! If it's too lofty a goal from the start, then start small and target the 'low-hanging fruits' for your initial efforts (that which is easiest to identify and to eliminate from your waste stream). You don't have to wait until "someone" says to start. Be an 'insurgent' in your organization and be a leader! You will be amazed at the positive response of your co-workers and utltimately your superiors! Start today! YEA - you are the perfect one to be the 41.000th page view! Thanks for sharing your insights and encouragement. We're flattered that recycling containers from CleanRIver Recycling Solutions are in such good company. Yes, humor is effective - and so much more pleasant than nagging! Thanks CleanRiver! This is one of my favorite pics so be prepared for it to show in many future blog posts along with PPT presentations for speaking engagements.